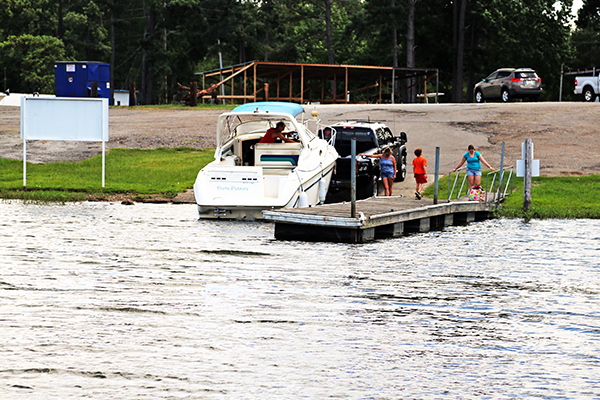 Lake up or lake down, all year round, SouthShore Marina’s boat ramp can accommodate any type or size boat. 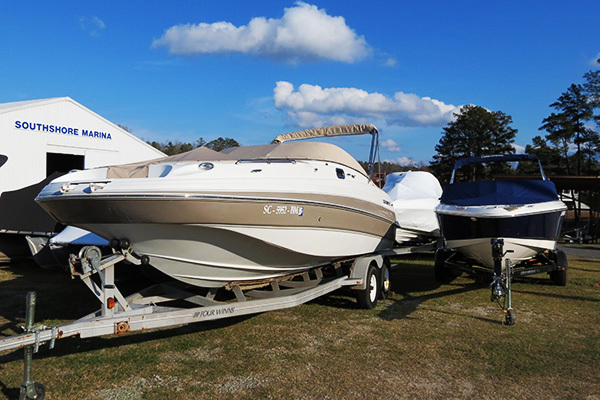 From Jet-Skis to 100′ houseboats, SouthShore’s ramp can handle your needs. So come on down, enjoy our hospitality and get out on the lake. Your boat, truck and trailer will be safe with us. Access to the ramp is open 24 hours a day 7 days a week, including holidays. Public Ramp Fee: $10.00 per day. Overnight Trailer Parking: $10.00 per night. 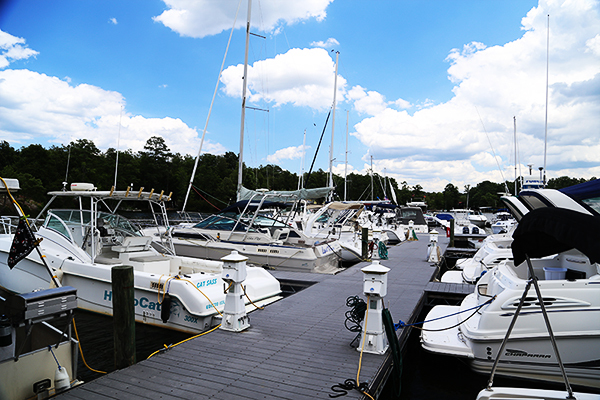 SouthShore Marina has some of the newest docks on Lake Murray. All of our customer slip docks were built in 2008 or newer. Our latest addition, built in 2015, is our covered dock. These docks are heavy duty, commercial strength, galvanized steel frame construction with concrete or composite decking on all exposed docks and wood decking on our covered dock. Your boat is safe with us. Our covered slips are our latest addition, constructed in the spring of 2015, featuring 26’ and 27’ wide double bays with 26 ‘ fingers providing 28’ of cover, 14’ wide single bays with 30’ fingers providing 32’ of cover, 15’ wide single bays with 36’ fingers providing 38’ of cover, and our largest slips, 18’ wide single bays with 40’ fingers providing 42’ of cover. All bays have 17’ to 20’ eve heights to accommodate even the tallest boats. With power, water and satellite available in all slips, this is the perfect place for you and your boat. See B – DOCK COVERED below for more details. Our uncovered slips, all built after 2008, are galvanized steel frame with composite decking. These solid, stable and safe docks are perfect for the safety of your boat and family. Sizes range from 22’ wide double bays with a 24’ finger, to our 28’ wide double bays with 40’ fingers accommodating everything from your 18’ bow ridder to your 50’ houseboat. Power and water are available in the larger slips upon request. 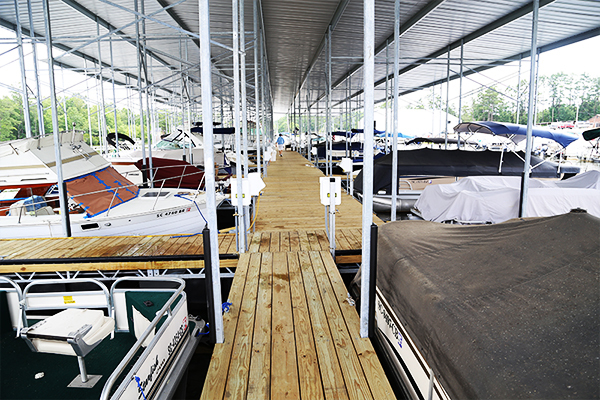 Bow ridders, deck boats and pontoons fit nicely on our A – DOCK. This safe and sturdy dock has easy access to parking and the water. The double bay slips are extra wide to provide ease of docking and enough space for your boat and fenders without interfering with your neighbor. Cruiser slips up to 30’ can be found on both B – DOCK and C – DOCK. These slips have wider bays, longer fingers, water and individually metered power if needed. Utilizing the same solid, galvanized steel construction, these docks are perfect for your vessel. For cruisers and houseboats 30’ and larger, we have the slips for you on C – DOCK. Our outward facing slips with up to 40’ solid and stable fingers make docking your large vessel an ease. Since there are no docks in front of your slip, there is plenty of room to maneuver around. All slips have individually metered power receptacles and water available. Our dry storage building is perfect for storing your bow rider, center console or bass boat up to 20’ in length. 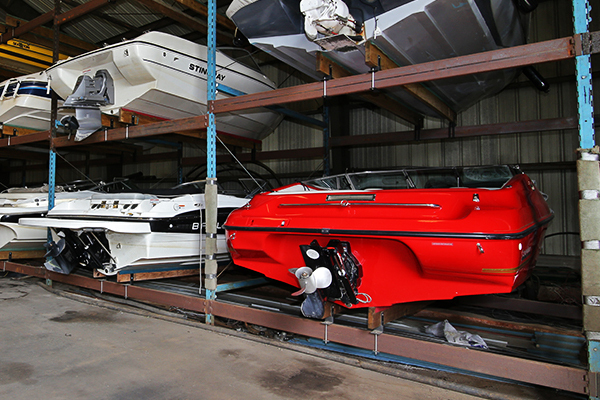 Stored out of the water, sun and weather, our dry storage building keeps your boat in great shape for years to come. Just call us before you head our way and we will have your boat in an in-water slip before you get here, fueled up, if you need it, and ready to explore the lake. When you are finished, you just dock it back in a designated slip and we do all the rest. We’ll have it picked up and put back in the building, until you to call again for your next adventure. 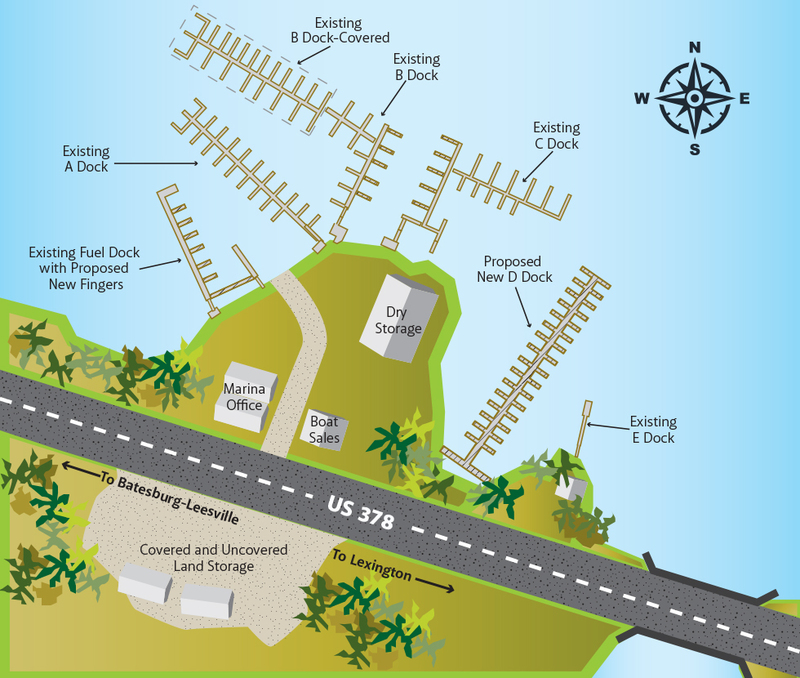 Uncovered storage for your boat on SouthShore’s property is available for short and long term. This type of storage can be used with or without launch and haul out services. 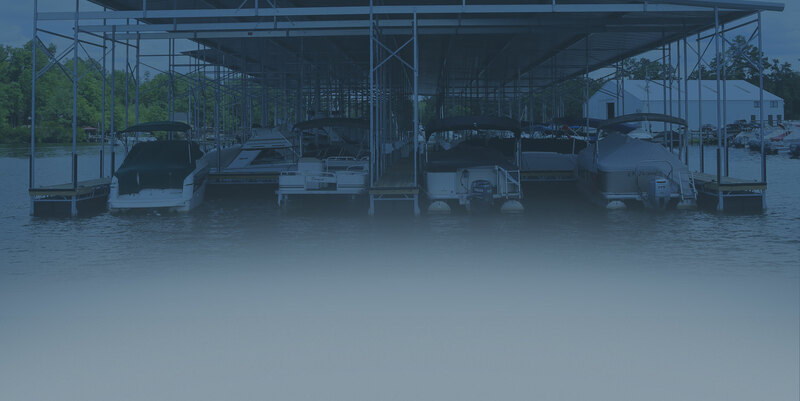 Just like our building storage, call before heading our way and we will have your boat in the water, ready and waiting for you and your family to explore the lake. You’ll love this type of storage if you have a 20′ and larger boat with a trailer. Combining the advantages of dry storage and in-water slip storage, you get the best of both worlds. Just like uncovered land storage, covered dry storage provides full access to the lake with our launch and haul out services. Call before you leave your home and arrive with your boat in the water, ready and waiting. 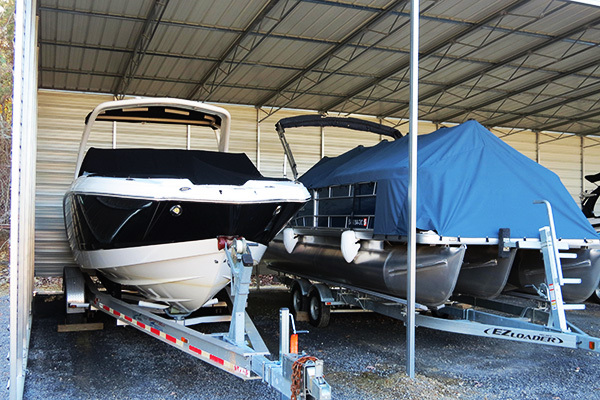 When you are not using your boat, it is stored safely on your trailer under a cover, protecting it from sun and weather. 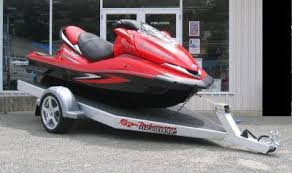 Jet-Ski storage is one of our most convenient types of storage. We will put your Ski in and we pull your Ski out, place it on the trailer and store it. A one-time fee applies. No monthly bills, just call ahead to have your ski put in. A-Dock is great for pontoons, bow riders, deck boats and small sail boats. Its 22′ wide double bays with 24′ fingers leave extra room to make it easy to enter or depart your slip without any interference from another boat or finger. The galvanized steel frame with composite decking make access to your boat comfortable, safe and splinter fee. Your boat will love you for docking on this dock. B-Dock, uncovered is designed for cruisers up to 30′ LOA. Power and water are available upon request and are individually metered for your convenience. These 24′ wide double bays with 28′ fingers leave plenty of room between and beside your boat to make docking easy and safe. If you have a vessel larger than 30′, we have 28′ wide double bays with nothing but water in front of you, making maneuvering and docking easy and safe. Constructed of galvanized steel frame with composite decking, access to your boat is comfortable, safe and splinter fee. This is a great dock for your boat and your family. B – Dock, covered is our newest dock at SouthShore Marina. Built in 2015, its 20’ tall eve heights can accommodate almost any boat, except sail boats. Double bay slips are 26’ and 27’ wide with 26” fingers that provide 28’ of roof coverage. The single bay slips are 14’ wide with 30’ fingers that provide 32’ of roof coverage, 15’ wide with 36’ fingers that provide 38’ of roof coverage and 18’ wide with 40’ fingers that provide 42’ of roof coverage. These slips are wonderful to relax on, sitting in the shade, out of the sun or rain. Not only do they protect your boat, but they save energy by keeping cool in the summer and warm in the winter. Life is good under the new covered dock. C – Dock has two types of slips. First, there are the 24’ wide double bay slips with 28’ fingers that are perfect for all boats up to 30’. Then there are the 28’ wide double bay slips with 40’ fingers that can handle vessels up to 55’ in length. Like the other docks, C-Dock is constructed with galvanized steel frames with composite decking, making them safe and sturdy even out at the end of the 40’ fingers. You’ll just love hanging out on these docks all year long. D – Dock is great for pontoons, bow riders, deck boats and small sail boats. Its wide double bays and long fingers leave extra room to make it easy to enter or depart your slip without any interference from another boat or finger. The galvanized steel frame with concrete decking make access to your boat comfortable, safe and splinter fee. Your boat will love you for docking on this dock. 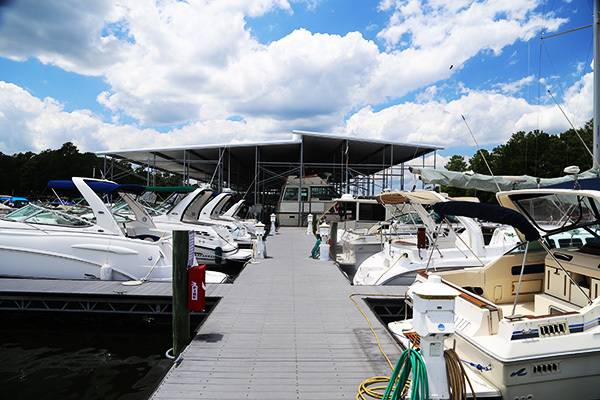 Transient / Fuel Dock is for fueling your boat, waste pump-out, storing your boat over night or just stopping by to pop into the store for drinks, ice, snacks or the largest selection of water towables on Lake Murray. Transient storage can accommodate all sizes of boats along with power and water. Stop by to visit for the night or longer, we would love to have you.